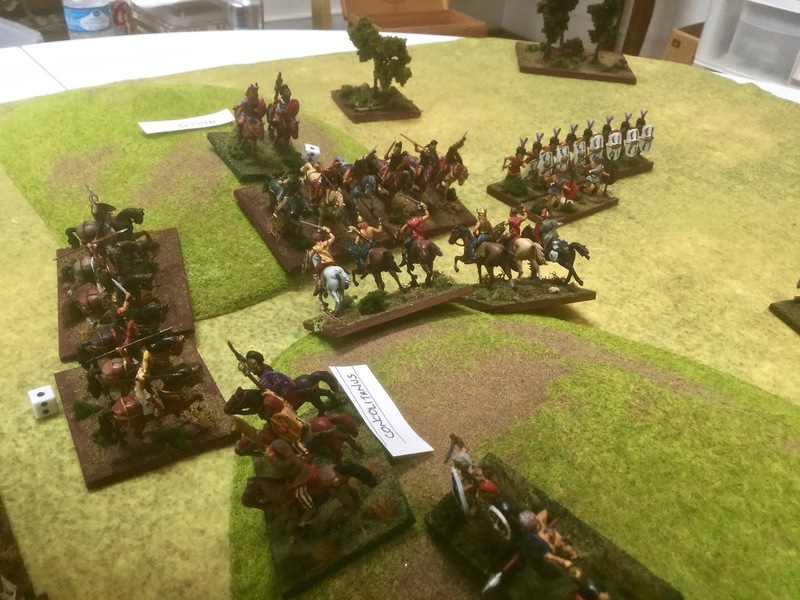 This is the fourth game in the series in which I am adapting a Command and Colors Ancients (CCA)scenario to play with my modifications to DBA 1.0. The game was played on a 36″ by 36″ table. Converting the CCA game pieces to match elements in my DBA system was not exact but fairly close. “However, when the Roman javelin-throwers, following the regular tactics of Roman warfare, advanced in front of the legions and began to hurl their weapons thick and fast, the cloaks and trousers of the Celts in the rear ranks gave some effective protection, but for the naked warriors in front the situation was very different. They had not foreseen this tactic and found themselves in a difficult and helpless situation. 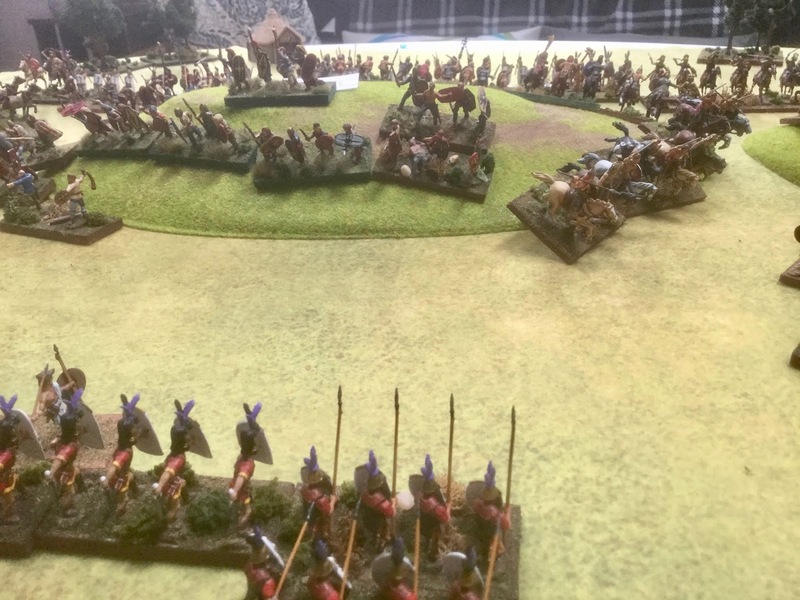 The shield used by the Gauls does not cover the whole body, so the tall stature of these naked troops made the missiles all the more likely to find their mark. After a while, when they found themselves unable to drive off the javelin throwers who were out of reach and continued to pour in their volleys, their nerve broke under the unbearable ordeal. Some of the men rushed forward in blind fury and threw their lives away as they tried to close with the enemy, while others gave ground and fell back step by step into the ranks of their comrades, where they created confusion since they were evidently backing away from the enemy. Below is the CCA map and deployment. Some of the modifications to the basic DBA system was giving the Gauls a number of Bd’s. 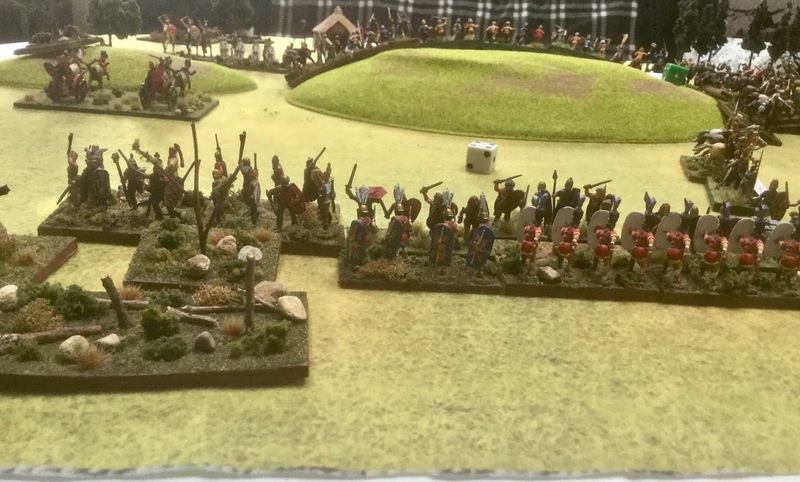 I believe that in general the Celts would have had a core of well armed warriors and in this situation (being trapped) they would have had plenty of incentive to fight fanatically. Bds reflect the better armed as well as a degree of fanaticism. My morale system reflects staying power in a basic way. Superior elements are allowed 4 recoils and then are destroyed. Average elements are allowed 3 recoils and poor elements only 2. The recoils need not be consecutive and some of the small dice you will see below represent how many recoils have been accumulated. Another innovation is the use of Ps. An element of Ps can be attached as a sub-unit of another infantry element but not another Ps (at least not in this game). The supported element receives a plus one to their CF. If the element is destroyed then so are the Ps but the Ps do not count toward core units destroyed. In this game two elements of Wb could be stacked to give the Wb a plus one to it’s CF if the Wb initiates combat. The bottom line in all that is to try and make the game a bit more interesting in a historical simulation rather than in a competitive style game that DBA was designed for. We played the game in about two hours. Given the fact the Gauls were hemmed in by three Roman armies they didn’t have much of a chance. In tinkering with the play balance we managed to get a 9-4 game result with the Romans destroying 9 elements while losing 4. 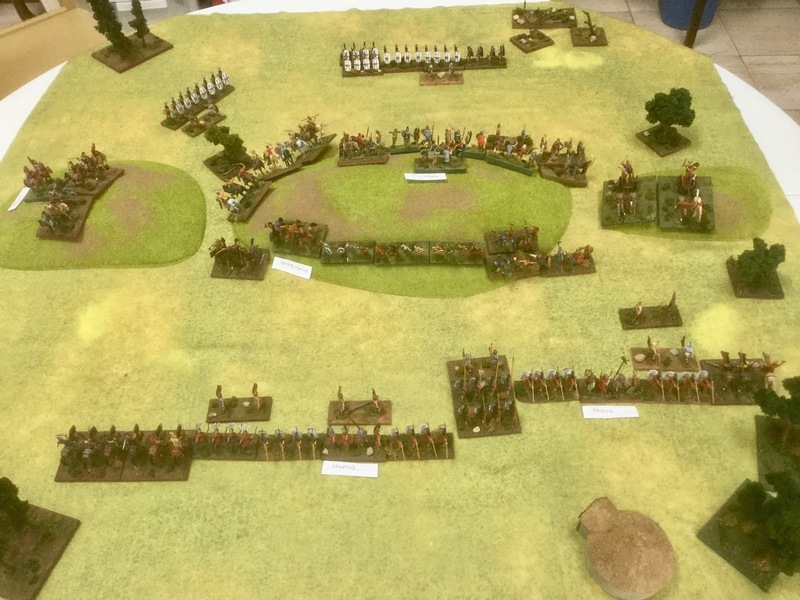 My friend JZ played the Gauls and he said they had a shot and that a 40% chance of a win was possible. We were both satisfied with play balance. Aerial view. 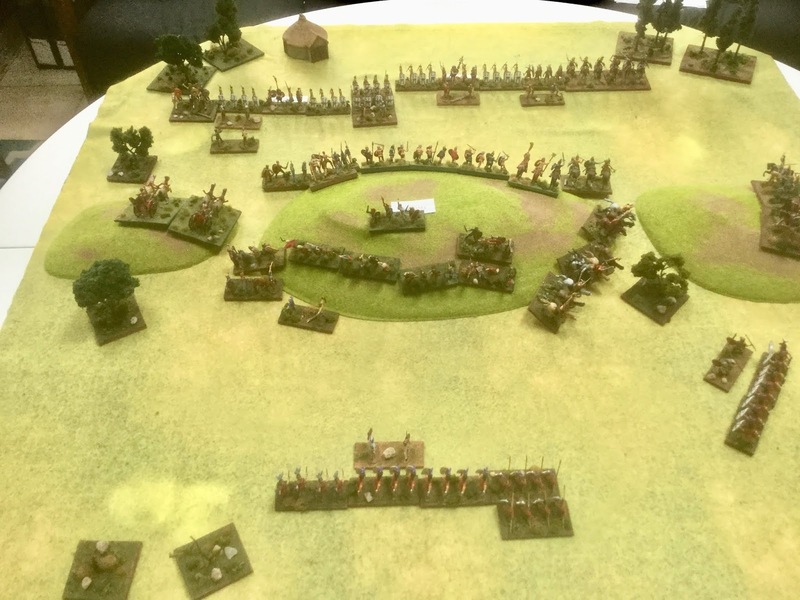 The Gauls have the high ground in the middle of the board and are hemmed in on three sides by the Romans. The white markers are the commander’s names. 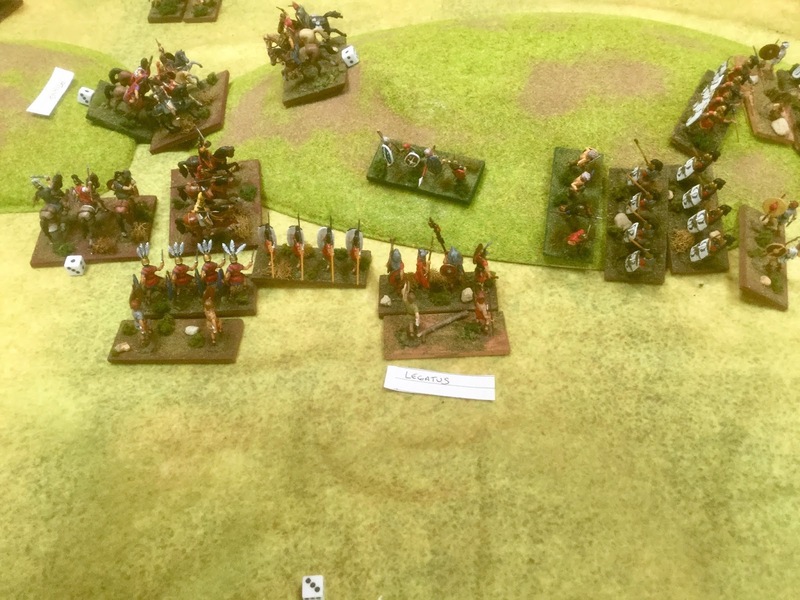 Each commander was allocated 1\2 die roll plus one for the number of pips allowed in a bound. This meant the maximum number of pips per command was 4 but never less then 2. Another aerial view but this time from the other side. The Roman army on the bottom of the picture was the weak link for the Romans. 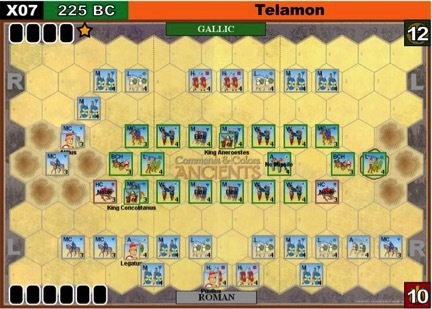 The Roman cavalry on the right side of the table was the Roman advantage since it negated the Gaul up hill advantage. The Romans on the top part of the picture would have to slug it out going up hill. The Gaul chariots on the left side of the picture were another Gaul disadvantage and one that would prove disastrous. 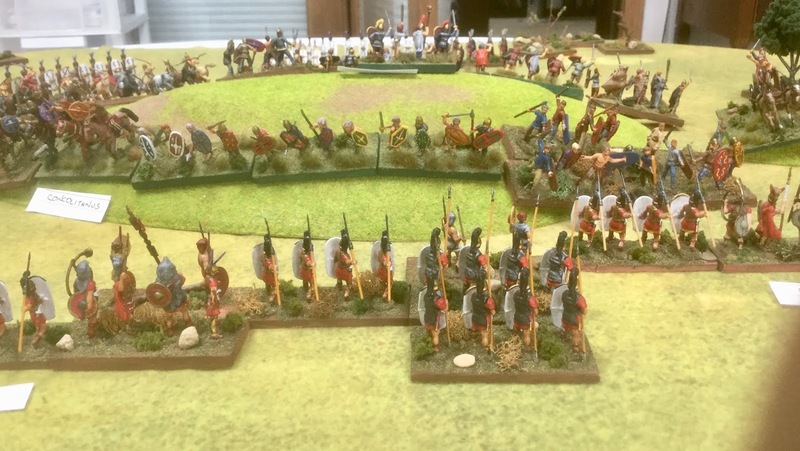 Romans preparing to assault the ridge line. Many of the Gaul elements here are Bds and a frontal assault would take some time. The Gauls on this side of the ridge would leave the ridge and attempt a break out here. 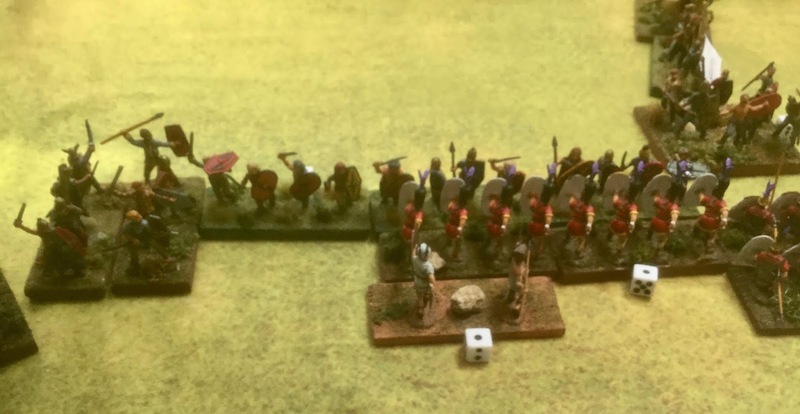 The Romans would achieve the victory condition before the Gaul assault could bear fruit but another turn or two this Roman command would have died to a man. This Roman army suffered the most as the Gauls easily outflanked the Roman line and began to roll it up. 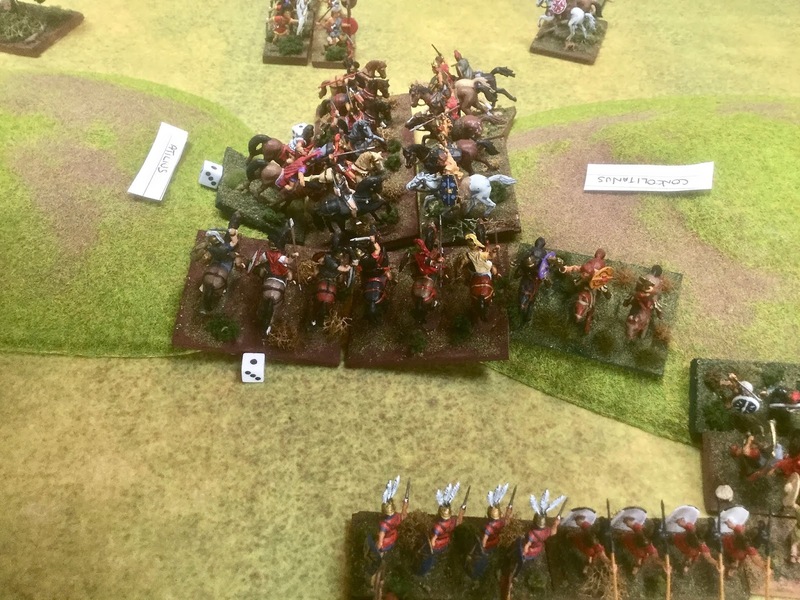 The Romans had an advantage here with their cavalry and after an initial rebuff their numbers began to make a difference. The Romans are about to get out flanked. The Gauls had to destroy at least 5 elements from this Roman army to win. It’s the only place where they had a significant advantage. 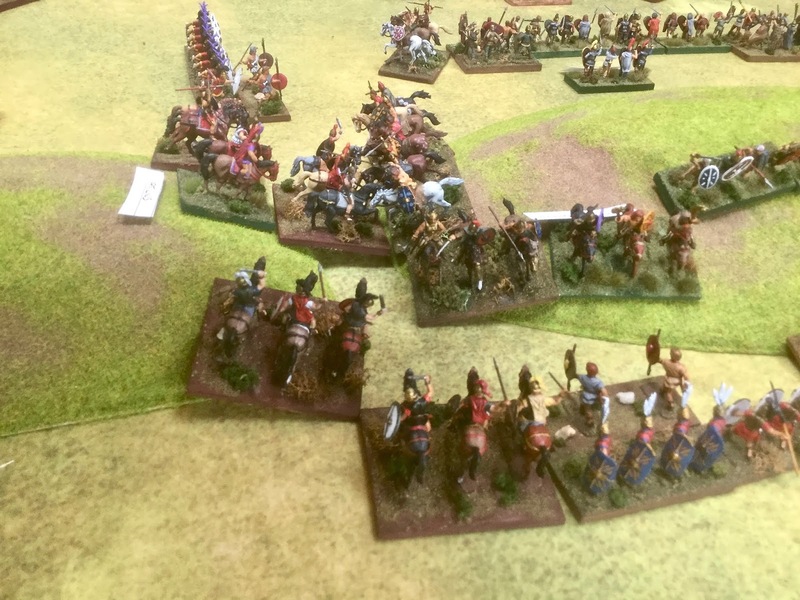 The Gaul cavalry on the Roman left fought bravely but were outflanked and began to give way. 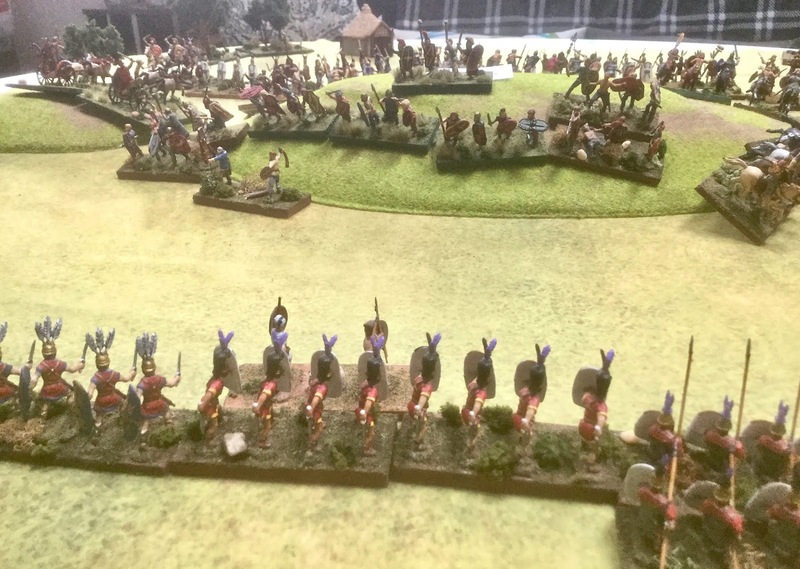 The Gauls here begin to roll up the Roman line. A rare example of Roman horse besting their opponents. 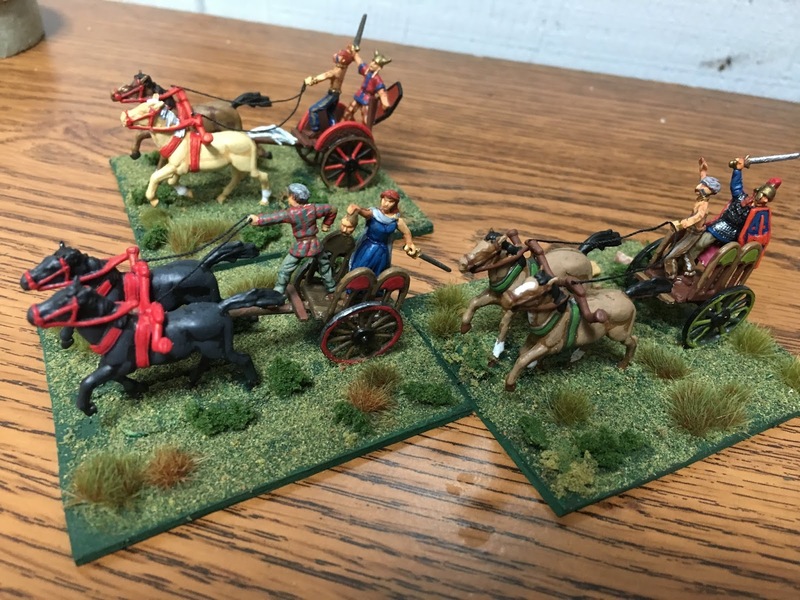 The Gaul chariots (not pictured) charged and were destroyed thus leaving the Gaul flank open. The Romans were on their way to a double envelopment. 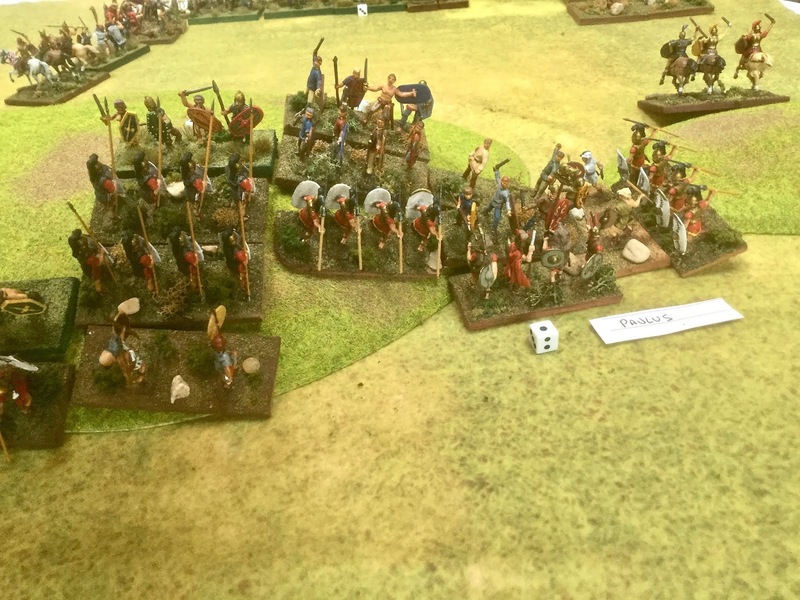 Looks bad for this Roman army. The two elements with the small dice by them have already acquired a recoil and are about to get outflanked to boot! The collapse of the Gaul right. The collapse of the weaker Roman army. The game was called when the Gauls lost 9 elements. They had to destroy 10 Roman elements before losing 9. Tough victory conditions but a good time since sometimes the best games have an air of desperation to them. 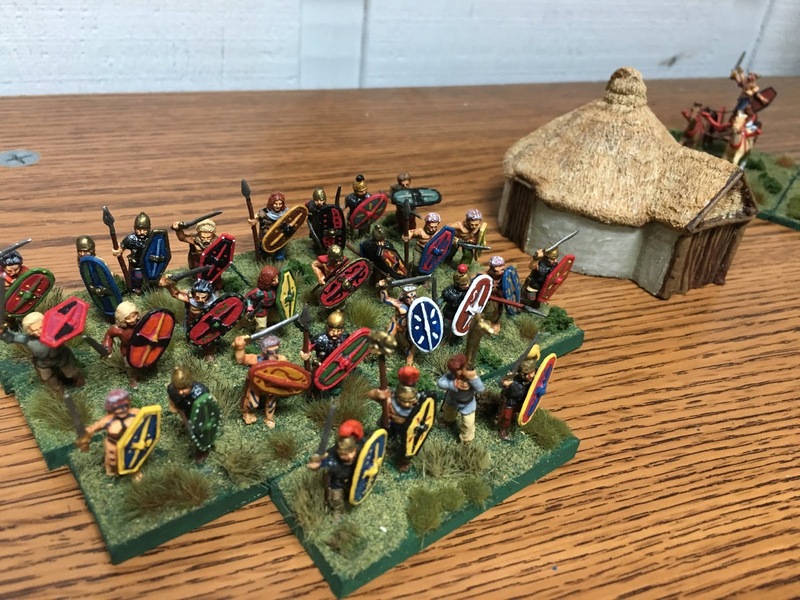 Nothing to do with the game-just some of my Newline Celts and Celtic hut. Two of these were in the game. Chariots by Hat. ← Who was Gunther Grunau?